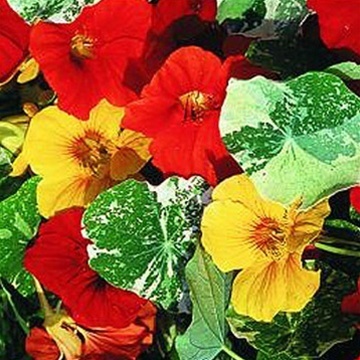 Meet the "Seedy" Side of Our Nasturtiums! 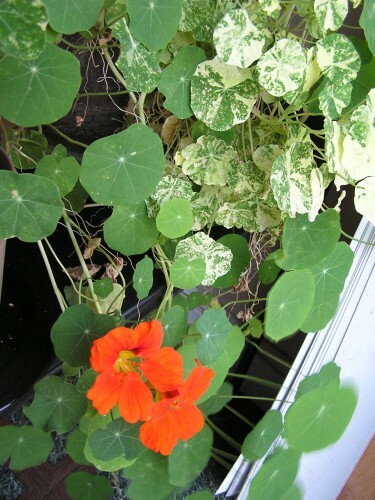 This past fall I salvaged some ‘Alaska Mix’ and ‘Empress of India’ Nasturtiums who were at the end of their season and growing closer to being composted. I decided it would be a great winter project to try to keep these creeping beauties alive in my kitchen for their culinary value (their leaves, blooms and seeds are all edible!) and it would be a great test to see how green my thumb had grown since joining The Growers Exchange team. Though light is a little scarce since neighboring buildings block it for most of the day, and my cats terrorize the curtain-like foliage by using it as cover (and as a snack), I’ve managed to keep the majority of these guys green and somewhat healthy! It’s been interesting to see how at different points of the day the foliage will crane their stems to follow the sunlight as it moves across my kitchen, like these herbs have a mind of their own! While watering the other day, I readjusted some of the variegated, viney leaves to allow more of the ‘Alaska Mix’ to get more light and two, hard, green little nodes fell off! At first I thought this was some kind of pest or bug that had invaded my little indoor oasis, but after some research and thorough poking with my finger, I realized that my plant had started to go to seed. 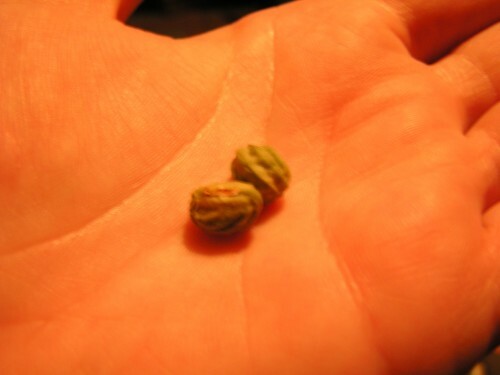 These light green seeds are rounded on one side and sort of pinched and puckered looking on the opposite side, and can apparently be prepared with hot vinegar to create “poor man’s capers”. These pretty annuals have been trying to go to seed all season and thus, end their life cycle. Keep yours blooming by continuing to prune dying foliage back and to deadhead them which will prevent the process of going to seed and keep them vibrant for much longer. I’m going to try to plant these alien-looking little seed pods and see if I can sprout some more of these awesome spiller herbs! 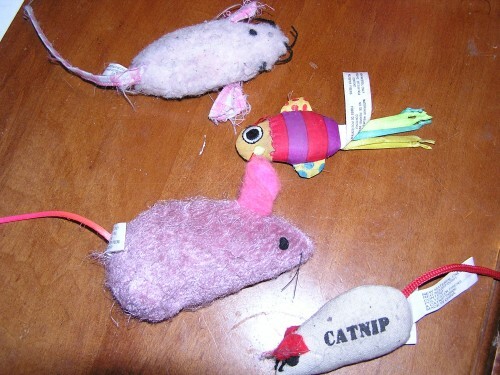 I also recommend growing these indoors to any novice or brown thumb, like myself, or to anyone who has kids. 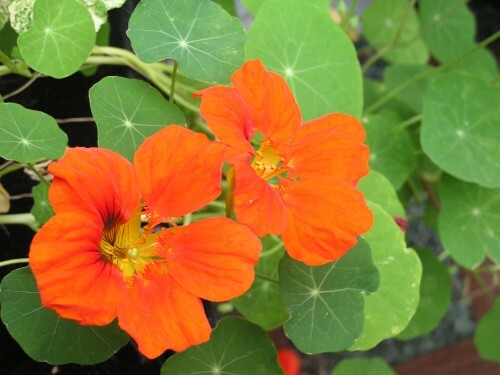 The Nasturtium‘s non-toxic, edible leaves make a beautiful contrast to their bright, continuous blooms, and because they grow quickly and can take a little abuse or neglect. Though I need to repot mine, as they’re getting too big for their britches, I’d recommend a hanging pot or container to hang them in a sunny window. 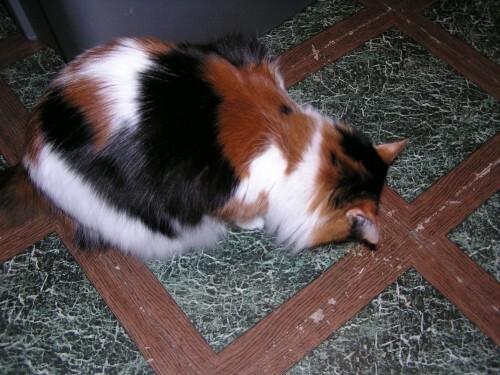 This way, their leaves and tendrils can have room to stretch and grow, and they’ll be out of the way of little furry monster who may try to dine on them. These Nasturtiums, along with a few Calendula (which I haven’t been as successful with) have been a true delight during these dreary, cold months. Just a little green around your home can make a huge difference in picking up your spirits while it’s gross and gray out. 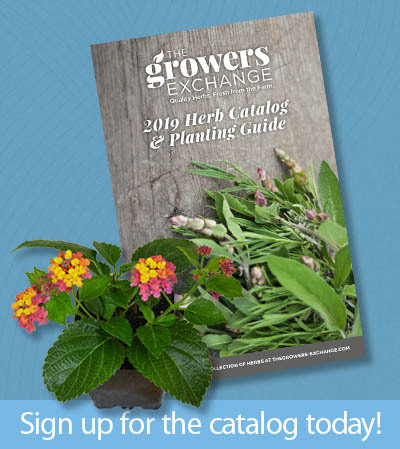 Try growing some today– they’re a great first time herb plant! 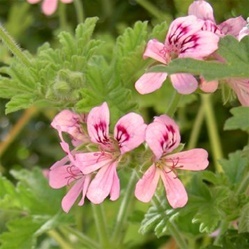 It Makes "Scents" to Grow Pelargoniums! There are over 200 variations of Pelargonium, each with a specific scent and beauty. Oh Scented Geraniums, so lovely, so fragrant, so easy to grow, so…not even geraniums at all! Scented Geraniums are not considered “true” geraniums and are of the genus Pelargonium, but their leaves do resemble geraniums and they share the same botanical family. 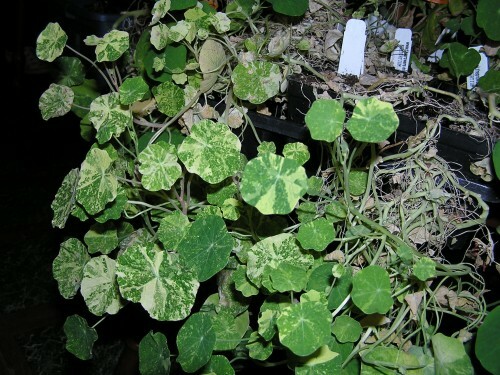 Their success as portable container plants make them favorites in almost any climate, both inside and out. Scented Geraniums are native to South Africa, but became hugely popular with Europeans in the early 16th century. Thomas Jefferson was known to grow several varieties at the White House, and here at The Growers Exchange, we sell three of our favorite varieties: Citronella, Old Fashioned Rose, and Atomic Snowflake. 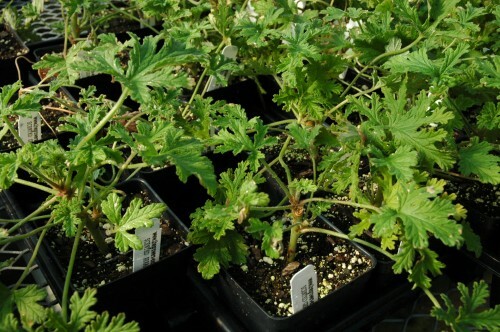 The sweet Citronella fragrance comes from the plant's foliage, not its blooms. 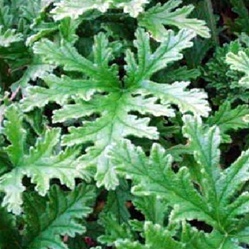 Citronella is probably the most well-known, due to its use as a safe and natural insect repellent. Oil from this plant is commonly extracted from the plants and added to home-made and over-the-counter products. 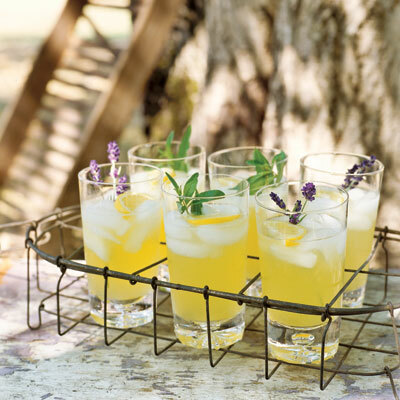 Many gardeners also plant bushes of Citronella in their gardens, and simply swipe the mass with a broom to bruise the foliage, which releases the plant’s fragrant, citrusy aromas. Though it’s sometimes debated whether this actually works effectively as a repellent, when planted in large quantities, we’ve noticed a significant decrease in mosquitoes around our patio on warm summer evenings. We’ve also found that the lemon and rose varieties are the best for container planting. They will grow compactly but a little goes a long way! Their perfume will freshen your patio or home as long as you keep it nice and happy with plenty of sun and adequate watering. Great in the garden but also quite content in a hanging container or pot, be sure to provide well-drained soil, and not to over-fertilize. It is actually better to under-fertilize than over-fertilize these aromatic beauties, as soil excessively rich in nutrients (especially Nitrogen) can cause leaves to be less fragrant. Fertilize from spring through fall for best results, and fight the urge to fertilize during the winter. 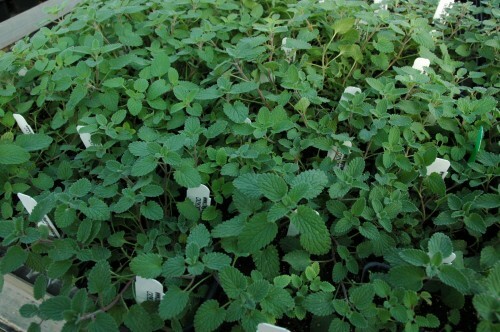 This is when the herb naturally slows down production, and fertilizing at this point may trick it into a false growing period, which will result in less than favorable bloom and fragrance production. 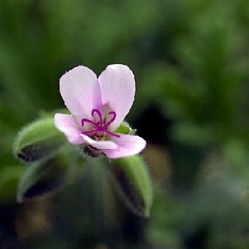 Clusters of sparse blooms are a defining characteristic of the Pelargonium. Thriving in bright light, be sure to place them in a southern-facing window with ample mid-day sunlight if growing indoors. Preferring daytime temps around 70 degrees, these continuous bloomers will flower until the first frost. 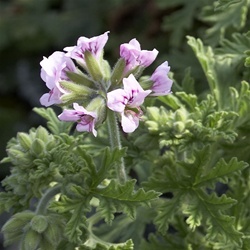 Overall, scented geraniums are quite drought-tolerant and therefore relatively easy to grow plants. Do not allow them to completely dry out before waterings, but at the same time be sure not to over-water, as constantly saturated soil can cause root rot problems. Clay pots help gardeners who tend to get a bit water-happy, as they allow excess water to seep out through the porous clay. Moisten only the soil when needed, rather than watering the whole plant, to ensure that it gets just enough water without drowning. Though they vary in shape, size and color, every variety shares the same five-petaled bloom design. Prune in early spring for fuller blooms and foliage. Cut right above the node with clean, sharp shears. Pinching and pruning redirects the plant’s energy back into the remaining stem, forcing it to sprout new, thicker, fuller growth. Early spring pinching takes advantage of the plant’s natural growing season, allowing the plant plenty of time to grow before its natural slower-growing-months of winter. They are also a popular bonsai plant and can be pruned and trained to resemble a more fragrant replica of a bonsai tree. Growing Scented Geraniums is easy if you give them lots of sun and adequate water. 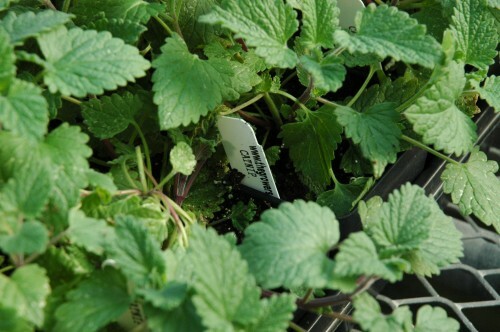 Scented Geraniums can be germinated from seeds or propagated from stem cuttings. When growing from seed, they typically germinate quickly, sprouting in a mere few days to a few weeks. Keep the seedlings out of direct sunlight as they will not grow if the soil is warmer than 75 degrees. From trial and error, it seems that plants started from seed rather than propagation tend to be stronger, and resist disease and cold temperatures better. 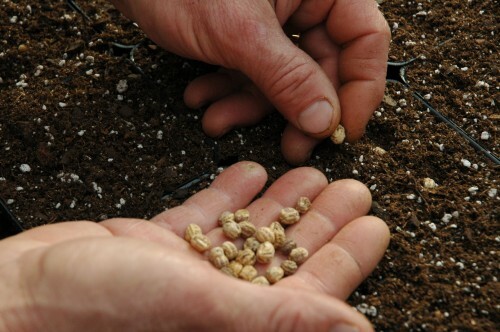 After planting, you should see blooms twelve to sixteen weeks after the seeds are sown. If propagating from cuttings, make sure to start in early fall, and to cut four to six inches from a healthy, mature plant just below where leaves or nodes are growing. 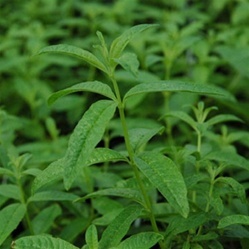 Taking a large enough cutting, typically containing three to four leaves, should be a big enough piece that should stand any stress from the transplanting process. Also, once the new plant has established a root anchor and is beginning to mature, be wary when pruning. 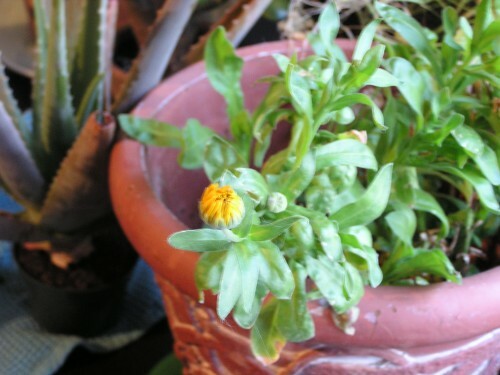 Pinch the growth tips back by mid-February or the beautiful blooming clusters will be postponed in flowering.